Getting down and dirty…. I have been asked by some our our Persian Cat loving friends what I use for litter. This is a messy subject, I personally have attempted to slay the litter box dragon for many years. As perfect as our Persian Kittens are they do not toot glitter, I know I’m shocked too! We began with your typical sand box. Cleaning them as frequently as I do, I can’t say we had an actual “odor problem” but you definitely could detect a litter box existed in our abode. We tested several different litter granules but always with the same result. The litter would find its way out of the box. The only sand I like between my toes is at the beach, so stepping on the occasional escaped litter granule was very annoying. I placed carpets in front of the litter boxes to reduce litter tracking and managed to create more work for myself. The only thing that ever really changed about the litter box over the years was it’s scent. Although I enjoyed the Tropical Rain forest scent, my Persian cat was less then impressed. I figured that out quickly when she was “Stinking” outside of her box. Our cats litter dust has settled friends and we now have new options! I was happy to have something new on the scene and ran out to buy my very first Tidy Cats Breeze Litter System. What I love about Tidy Cats Pellets is that these heavier granules stay in the box. Nothing like their dusty cousins, these pellets for the most part stay put. What I didn’t like was the Pee Pads. Not only are they expensive but must be changed daily. Urine pools at the bottom of the box and the pad is meant to keep it absorbed. The process to change the pads is messy. On more than one occasion I spilled urine on my shoes. Not a huge fan of this litter box system. My next litter box trial was with the new Smart Cat Box. This box is very expensive, but is built to last. 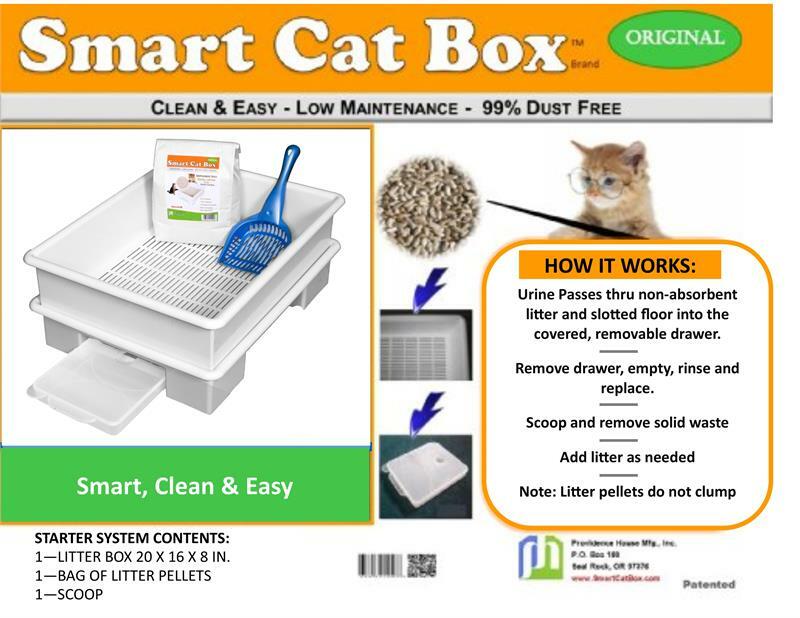 What I love about the smart cat box is that it has a receptacle on the bottom of the box that catches all the urine. You just pull it out and without having to touch it and flush it down the toilet. What I didn’t like was the Safflower seeds used for the litter. They scattered everywhere! Tidy Cat and the Smart Cat Box brought us Persian Cat owners some fantastic solutions to some very old problems. This is what worked for me. I kept the Smart Cat Box but have modified it and use it still today. I do not use the recommended Safflower seeds in my Smart Cat Box system, instead I use the Breeze Tidy Cat Pellets. The combination of the two systems has proved to be for me, the best of both worlds! The Breeze Pellets and the ability to dump out urine keeps our home odor free, the expense of the Breeze Pellets is justified as they last a long time. Disposable gloves make it easy to just remove the offending Poop. I wash my entire litter box monthly and my Persians princesses give me their “toot” of approval! Have a Catnip kind of day! This is the most special loving cattery to which I have ever associated ! These are not just cats, they are their babies and extensions of their family. Their kittens are so loving and well adjusted. This is a reflection in the manner in which they are nurtured from birth. We already have two Emerald Coast Persian cats and we may not be done yet ! Thanks you so much Michael! That means the world to us, we always love knowing that our babies move on to their furever homes with amazing families such as yours!